In a few weeks, the Carbon 2.0 theme now available in SDL Tridion 2013 SP1 will start catching up to SDL Tridion Education materials along with somewhat new "About SDL" slides that describes Customer Experience Management (CXM). In a previous post, we had fun with the SDL Tridion "Carbon 1.0" icons. Though I attempted a Carbon 1.0 version, check out the even better version of Content Porter dependencies (login required). SDL employees can of course start updating official materials with the new look-and-feel. Partners, independent consultants, and customers could look to match the new look-and-feel for extension buttons. But be wary of using Carbon 2.0 icons especially in non-SDL software to avoid breaking copyright laws. The familiar-looking "Save & Comment" icon in the PowerTools is probably okay but using Tridion graphics in your custom CMS... not so much (tell me that's obvious). I've also had the chance to reach out to the technical writers to see where we can share design approaches (thanks for the examples and help with conventions, you rock!). This is the Midas Rule in reversve--you don't need to invent conventions, make a template, or suggest a style guide when much more qualified experts have done the research and created all of this already. Marketing has a fresh template and a style guide while the Tridion docs on SDL Live Content have diagram conventions, which are already based on the software along with technical writing conventions. Maybe I'll admit to them I used to carry the Tridion R5.3 Templating Manual around in a 3-ring white binder back as a customer. Expect to see even more consistency in our presentations, materials, and slide decks. It'll take some time to find all the old icons though, which suggests a good diagram keeps working independent of its look-and-feel. Indeed, the not-so-new big thing is human-made drawings that capture the essence of something over picture-perfect realism. And now I (anyone) can even draw Tridion concepts in a way that matches how they look in Tridion. Here's a sneak peak at some of the graphic changes fellow functional Susan Carr and I are wrapping up for Foundation and BluePrinting. If you've read my posts on the contextual Web, understand the elegance behind the Context Engine Wrapper, or see how Responsible and Responsive design is changing the Web you'll realize BluePrinting best practices are evolving alongside Web development practices. When faced with the Contextual Web, BluePrinting Best Practices get boring. Omni-channel, SDL Mobile, and systems that will help you manage contextual content have a practical impact on your SDL Tridion implementation. Hint: just like the practice of minimizing localization, it can mean fewer (design, in this case) Publications. What do you notice about this BluePrint design? 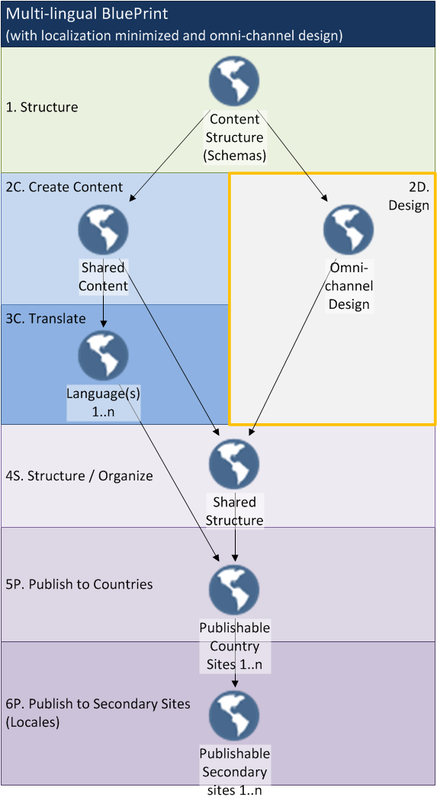 Aside from the graphics and differences in labels, do you recognize a (the) typical multi-lingual BluePrint design? So what does mobile mean to SDL Tridion BluePrint? It's definitely not a whole BluePrint publication level. Localization does not equal personalization. It might be a separate publication, possibly as a "service" that serves multiple channels (maybe with the CD Webservice, oh and btw see how OData describes Tridion). In an omni-channel, responsive/responsible setup, mobile doesn't force changes upon a BluePrint and you're free to manage sites in ways that match (now current) Web development practices. Basically your mobile approach might be included in your existing website publication, with variations managed in template logic (in Tridion or delivery, up to you). You can of course configure, personalize, or otherwise target certain content to certain contexts. In Tridion terms, this would be presenting mobile content based on component field options, target groups selections, and/or targeted component presentations matching a SmartTarget trigger. Do not be concerned if this doesn't match your current BluePrint or that you're taking another approach for mobile. A "Best Practice" may not be a Best Fit for your scenario. But also consider how (quickly) Web development practices for separate sites, apps, and responsive Web have changed. Have any new practices or changes to your SDL Tridion implementation approaches in light of mobile, contextual Web, and the latest SDL Tridion features? Leave a comment! Feel free to share your thoughts below. Some HTML allowed including links such as: <a href="link">link text</a>. Parking Lots, Bins, Tables, and WVTTK? Congrats to the 2014 SDL Tridion Community MVPs! My posts do not represent the opinions or position of SDL and its Affiliates nor those of past employers. Get in touch with Alvin Reyes on Facebook or Linkedin. Copyright 2018. Travel theme. Powered by Blogger.